Adam and Eve, c.-55, by Johann Ladenspelder. Engraving and etching on paper. The Large Bathers, c. 1896â€“97, by Paul CÃ©zanne. Lithograph on paper. The Sterling and Francine Clark Art Institute presents its latest exhibition, Copycat: Reproducing Works of Art. Exploring the line between innovation and imitation, the exhibition features 50 prints and photographs that are both original works of art and repetitions of drawings, prints, paintings, sculptures, and architecture created by other artists. The exhibition highlights the complex process of copying by studying replications of many rarely seen works from the Clark’s permanent collection, including those by Albrecht Dürer, Paul Cézanne, Eugène Delacroix, Rembrandt van Rijn, Roger Fenton, and Édouard Manet, among others. The exhibition also marks the first public presentation of one of the Clark’s recent acquisitions, Jean Dughet’s series The Seven Sacraments. Copycat will be on view in the Clark’s Manton Research Center building through April 1, 2012. The exhibition was curated by Alexis Goodin, Independent art historian and part-time Curatorial Research Assistant at the Clark, and James Pilgrim, a current graduate student in the Clark/Williams graduate program in the history of art, working in collaboration with Richard Rand, The Robert and Martha Berman Lipp Senior Curator, and Jay A. Clarke, the Clark’s Manton Curator of Prints, Drawings, and Photographs. Copying was a common artistic practice during the sixteenth and seventeenth centuries. Artists made copies as part of their training, to demonstrate or improve their skill, or to reproduce an image through a variety of printmaking techniques. 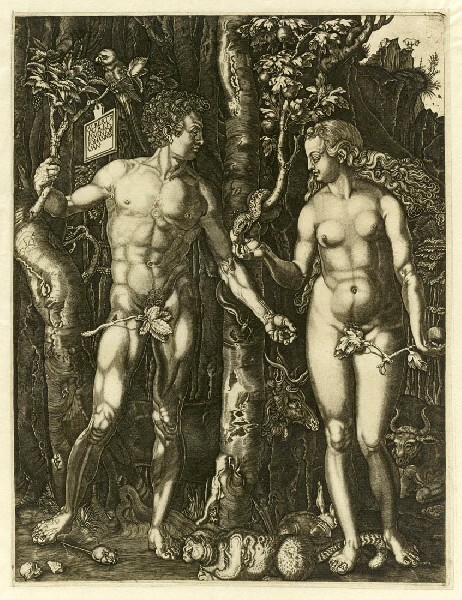 An artist might replicate a work as a tribute to a master, as Johann Ladenspelder intended with his copy of Albrecht Dürer’s Adam and Eve—or an artist might copy a work with the intent of forgery, as Marcantonio Raimondi copied Dürer’s Joachim’s Offering Rejected, part of the Life of the Virgin series. Marcantonio’s notorious engraved copies of this series, included in the exhibition, contained Dürer’s famous “AD” monogram and were intended to deceive collectors. When Dürer learned of Marcantonio’s scheme, he took the Italian artist to court, where it was decided that Marcantonio could continue making copies, but that he could no longer include Dürer’s initials. Painters have long been interested in finding ways to reproduce their work, whether to enhance their reputations, explore ideas in different mediums, share their work with a wider public, or profit by the sale of multiple versions of a single image. Some painters created their own prints, while others worked closely with professional reproductive printmakers. 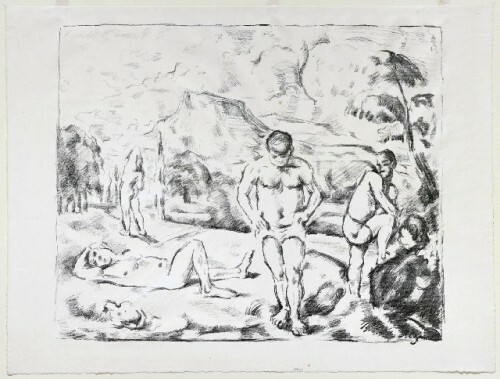 After the 1895 retrospective of his work, Paul Cézanne created prints to capitalize on his newfound fame; his print Large Bathers is based on Bathers at Rest, a painting he created twenty years earlier. John Constable worked with David Lucas to create prints after his paintings for the series English Landscape, which was published to promote Constable’s work to a wider audience. For the print Salisbury Cathedral from the Meadows, Constable worked closely with Lucas, but was ultimately dissatisfied with the print, remarking, “I am playing the devil with the Salisbury—for on looking at an early proof I find we have ‘lost everything.’” David Lucas reworked the print; Constable approved the changes and gave his son Alfred the rare late proof featured in the exhibition. Jean Dughet’s series The Seven Sacraments is another example of creative collaboration. This series is one of only three known complete sets of Dughet’s most ambitious undertaking. Dughet was a notable French print publisher of the seventeenth century and, as brother-in-law of the great painter Nicholas Poussin, also served as his secretary. His series of large-plate prints closely follows the first of Poussin’s The Seven Sacraments series of paintings. In his print The Sacrament of Ordination (Christ Presenting the Keys to Saint Peter), however, Dughet created a unique interpretation of Poussin’s work. He copied figures from Poussin’s first series but set them against the background of Poussin’s second series, melding two of Poussin’s paintings. This dramatic change suggests that Poussin was involved in the process and approved of Dughet’s modification of his work. In the eighteenth century, artists developed printmaking techniques that yielded more accurate replications of drawings. Chiaroscuro woodcuts and, later, aquatint allowed printmakers to imitate wash drawings and watercolors. In his print Allegorical Composition: Virtue overcoming Sin, Johann Gottleib Prestel used aquatint with gold woodcut additions to imitate the grandeur of Jacopo Ligozzi’s drawing. Two other new innovations in printmaking, mezzotint process and color printing, were stimulated by the popularity of reproductive prints, works specifically made to replicate drawings and paintings. Widely accessible, these prints were collected either in a portfolio or framed for display in the home. Georges Keating’s Her Grace the Duchess of Devonshire and the Right Honourable Lady Georgiana Cavendish (after Joshua Reynolds’s painting Georgiana, the Duchess of Devonshire, with her Daughter, Lady Georgiana Cavendish) was especially popular because its subject was famous for her charm, political convictions, and destructive gambling habits. In this mezzotint, Keating shows the duchess playing with her first child in an appealing depiction of motherhood, further adding to the sitter’s appeal. A photographer brings his point of view to the work he “copies” by making decisions about angles, lighting, and composition, among many other factors. 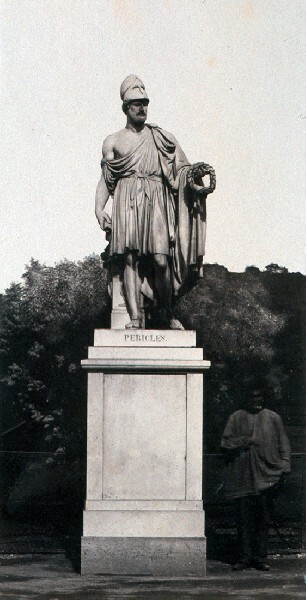 At first glance, the sculpture Pericles Giving Crowns to the Artists appears to be the main focus of Édouard Baldus’s photograph Statue of Pericles with Standing Figure in the Tuileries. However, Baldus also includes a man wearing a smock at the base of the statue who mimics the sculpture’s pose and dress. Baldus has captured the man’s faint form in contrast with the solid, crisply defined sculpture, by which he may have meant to suggest the impermanence of life. Visitors will also have the opportunity to view prints created after paintings from the Clark’s collection. 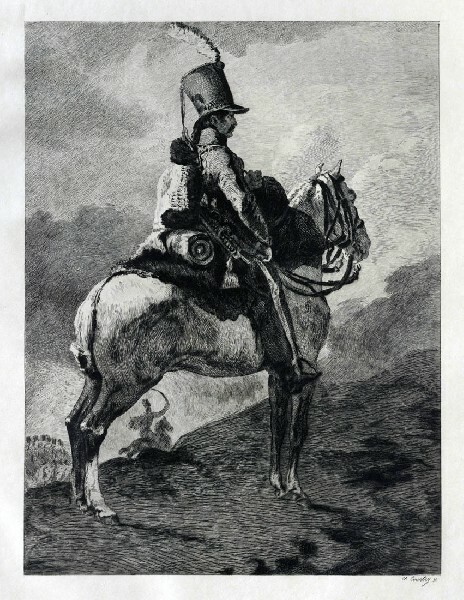 Examples include Charles Courtry’s print Trumpeter of the Hussars, after Théodore Géricault’s painting and Benedetto Montagna’s Virgin and Child (after Bartolomeo Montagna). The Clark is one of the few institutions in the world with a dual mission as both a museum and leading international center for research and scholarship in the visual arts. The Clark presents public and education programs and organizes groundbreaking exhibitions that advance new scholarship, and its research and academic program includes an international fellowship program and conferences. The Clark, together with Williams College, America’s foremost liberal arts college, sponsors one of the nation’s leading master’s programs in art history. While its gallery spaces have been reconfigured during the current construction phase, the Clark remains open to the public and continues to present a full-series of exhibitions, public programs, family events, and scholarly programs. The Clark is located at 225 South Street in Williamstown, Massachusetts. The galleries are open Tuesday through Sunday, 10:00 am to 5:00 pm during winter months. Admission is free through May. For more information, call 413 458 2303 or visit clarkart.edu.